The GMC Yukon mountain bike rides on rough terrain with ease; be it on dirt or snow, this bike is ready. In this GMC Yukon fat mountain bike review, you will learn more about this bike and its features. 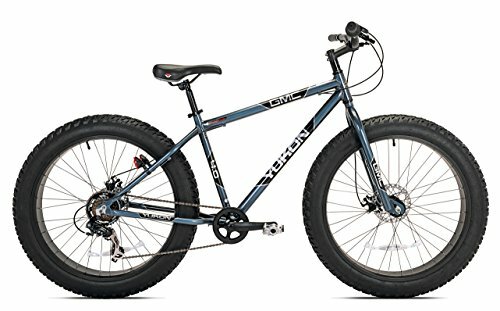 If you are planning to get a mountain bike for your trail rides, cardio exercise, or any other reason, you should try the GMC Yukon Fat bike (26-inch). It has the perfect combination of style and performance. Unlike the fast and agile road bicycles, this bike has the more about control and strength on tougher terrains. There are different types of mountain bikes designed for different purposes. Examples are, the Cross Country MTB, mainly for outdoor use; the Full suspension MTB, for rigorous and bumpy trail riding, and the Freeride MTBs, used for other types of mountain biking. Your choice will depend on your preference and style. The material used to manufacture the frame of the bike will have a direct bearing on the strength, durability, and weight of the mountain bike. A steel frame makes the bike heavy and difficult to transport; on the other hand aluminum frames are lightweight and affordable. Bikes made with carbon fiber cannot withstand heavy, intense mountain biking; there’s a lot of wear and tear off during the process. Hence, recommended for less extreme biking. The GMC Yukon Fat Mountain Bike is a unique bike which has wide tires (about 26" x 4") as its most remarkable feature. It is your ideal bike, especially for plus sized individuals. It features a thick aluminum frame and a high tensile steel suspension fork. This bike is very durable, comfortable and will allow for safe rides, irrespective of your terrain. 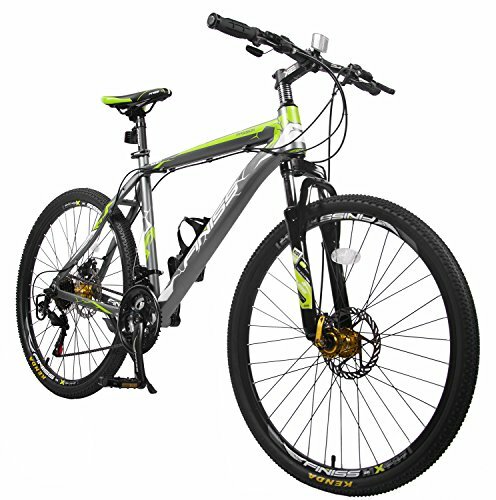 This bike also features front and rear disc brakes which are ideal for stopping abruptly along all trails. It comes with durable aluminum giant rims, which is particularly ideal for plus sized or heavy individuals who tend to be uncomfortable on regular bikes. This product features a durable 6061 aluminum frame, which is no doubt the most common frame components of mountain bikes in use today. The aluminum frame is durable and lightweight, which makes it easy to maneuver. It also makes it ideal for smooth and swift rides on rough terrain. The tires are the most remarkable feature of this mountain bike. This bike is uniquely designed with heavy tires (26" x 4") and can hold up to 300lbs comfortably. The rims come with durable aluminum, which is lightweight and sturdy too. Whether you are plus sized or not, you just cannot go wrong with these tires. It also features wide rims shaped for optimum strength, with fat tires protecting them. The tires are designed to contain a good cushion of air, preventing impacts from damaging the wheels/ rims. How much assembly time is required when delivered? It took me about 30 minutes to assemble and adjust. It is a very comfortable ride. I am 6' 3" and weigh 205lbs. Can anyone this tall fit in fine? I am 6', and weigh 200lbs and so I am sure it will fit you fine. It is a big bike. Yes, they are full rubber tires. They are fat and thick and cut through snow well. 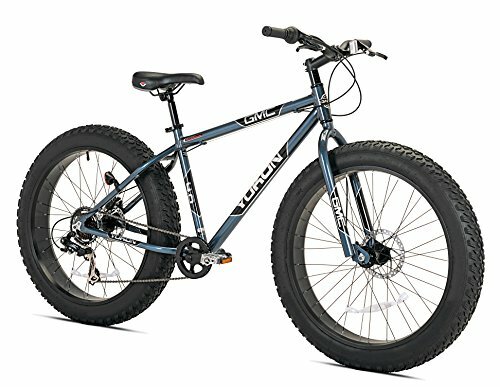 GMC Yukon Fat Bike, 26-Inch, is a mountain bike with large tires, generally about (26" x 4"), and with the capacity to carry even plus sized men or women. 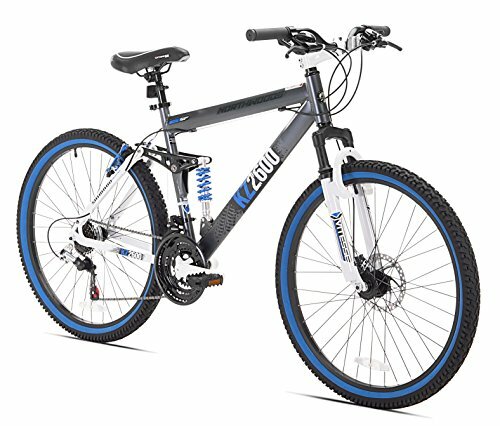 I would recommend this bike to anyone who enjoys mountain biking. The tires have more surface area and low ground pressure, which makes it easy to roll over very unstable surfaces; like thick snow, sand, mud, and rocks. It also has a lot of satisfactory customer reviews, so you have everything to gain when you purchase this bike.